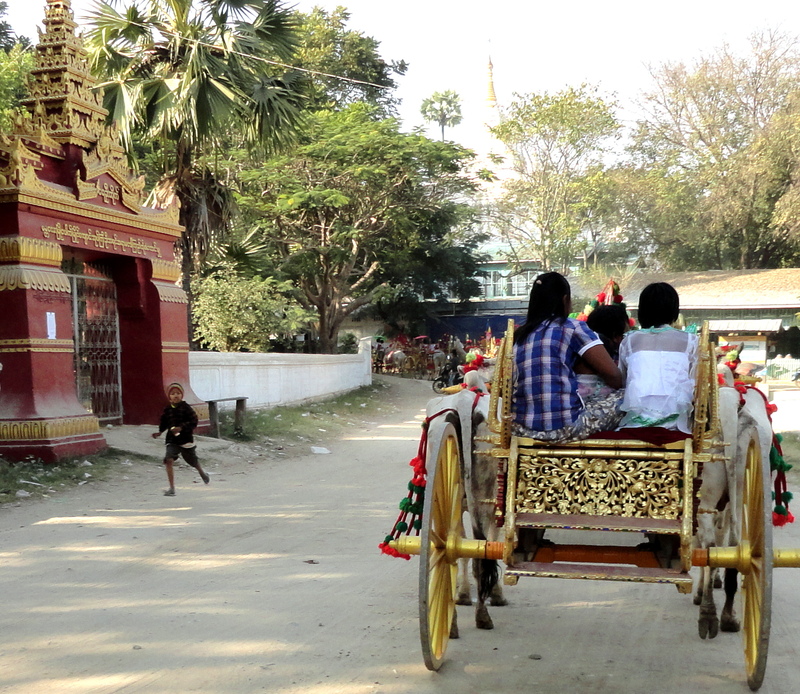 Children 5-10 years old dressed like royalty for a day and riding in gilded carriages in a half mile parade through their village of Mingun, Myanmar, were bidding farewell to the lifestyle as they know it. For the next day, their lives would change dramatically. 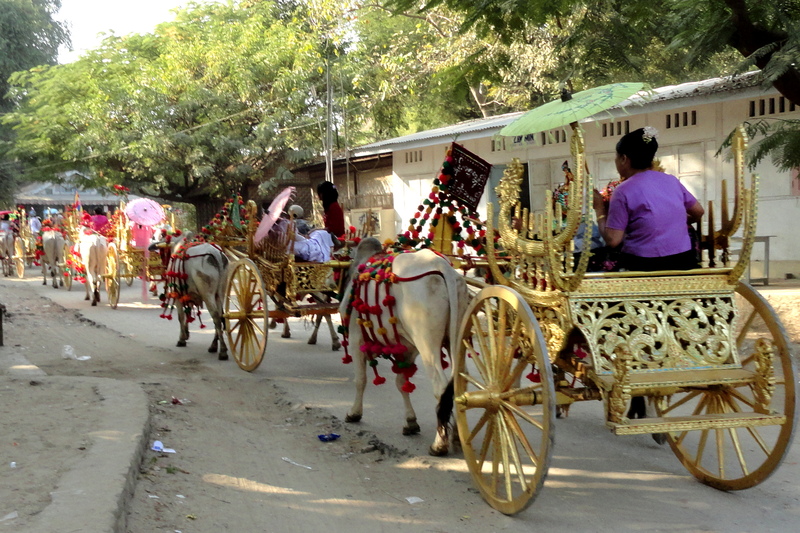 This was the 2-day Novice Initiation Ceremony for Monkhood-Nunnery, where gilded and decorated chariots and wagons carrying the young princes and princesses, both wearing makeup and lipstick, were being pulled by elaborately decorated Brahma cows and horses led in procession by a regally caparisoned elephant. An elephant always leads a parade as they are the largest animal in the world and were used since ancient times to lead parades. Gold, red, green, purple, blue, white and yellow were the dominant colors on the highly adorned children, animals and carriages in the parade. Each child had flowers and a brightly colored umbrella for protection and good luck. 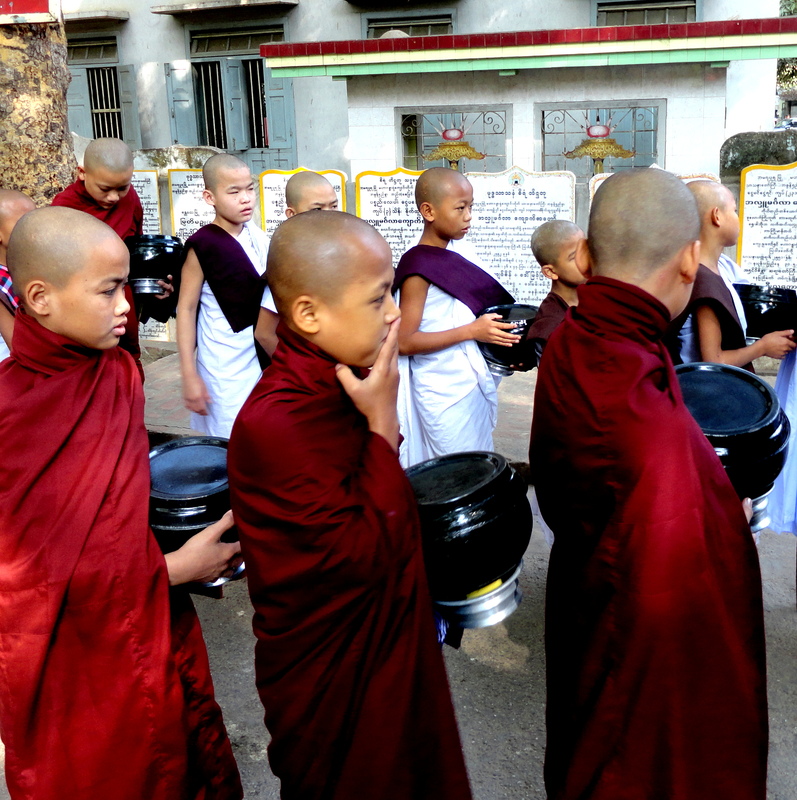 It is an honorable deed for parents to let their young children go to the monastery-nunnery where Buddhism is practiced by 89% of the people in Myanmar. By sending their young children to the monastery-nunnery, they receive great merits to obtain a favorable rebirth and it is the most important duty a parent can do for a child to become immersed in the teachings of Buddha. Being a novice is the most auspicious day in a child’s life and the novice parade begins it. The other most important day in their life is becoming a monk at age 20. Another reason parents will send their children to the monastery-nunnery is because they are unable to feed and educate them and the monastery-nunnery does it all. If parents do not have a boy to send to the monastery, they will adopt one or adopt one from a poor family. It brings great merits for the act of sending a child to the monastery-nunnery in Theravada Buddhism. It is a very meritorious act to send a boy to a monastery. The children go to the monastery-nunnery when there is an opening and most ceremonies occur around their New Year in April. The girls may also have their ears pierced with a gold needle at the same ceremony. Children from several neighborhoods gathered together to form the long parade. Before the parade, the parents watch their children closely to make sure they are not injured in any way to prevent them from the process of novitation, also called shinbyu. 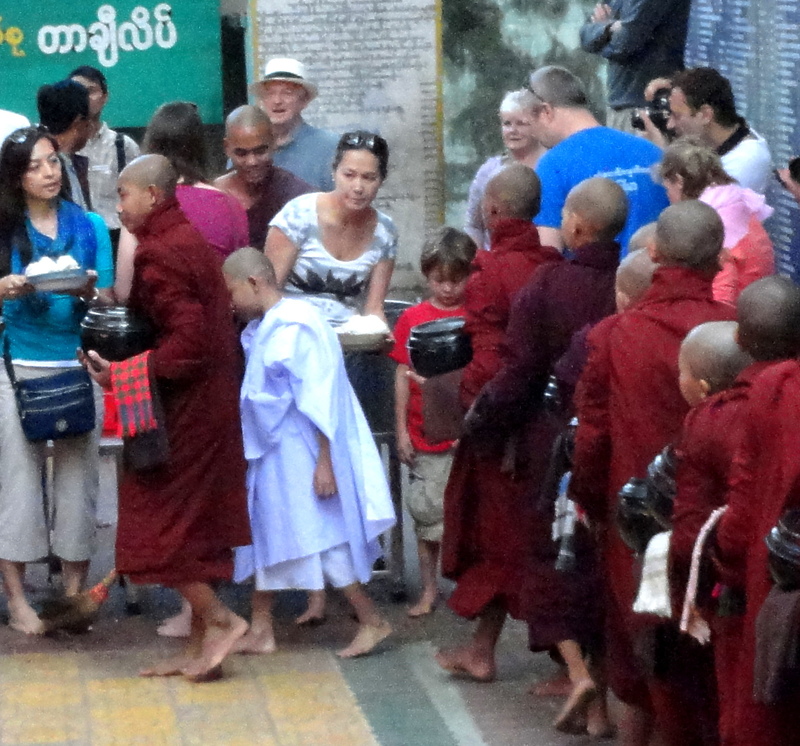 Sending their children to the monastery-nunnery costs the parents a lot of money. Many go into debt to do this for their children. 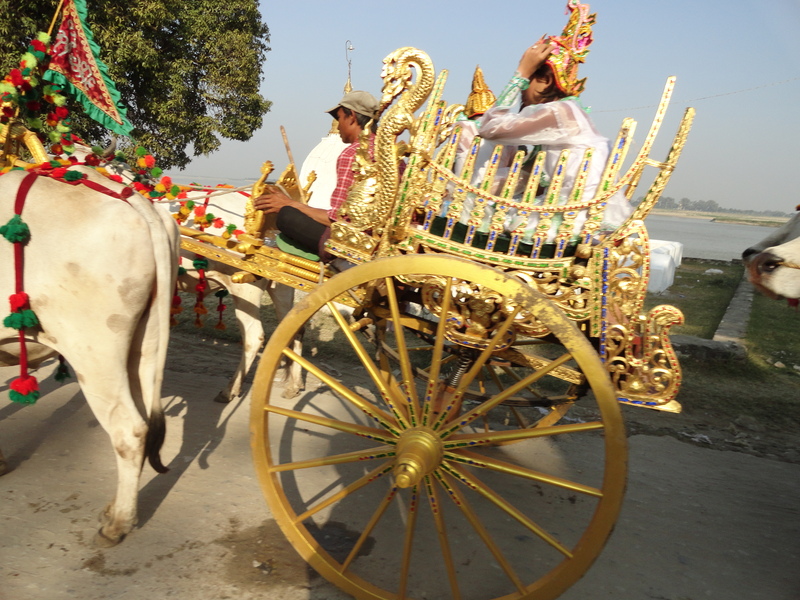 The gilded chariots, animals, elaborate prince-princess ensembles, animal decorations and all other things needed could be rented for the parade. 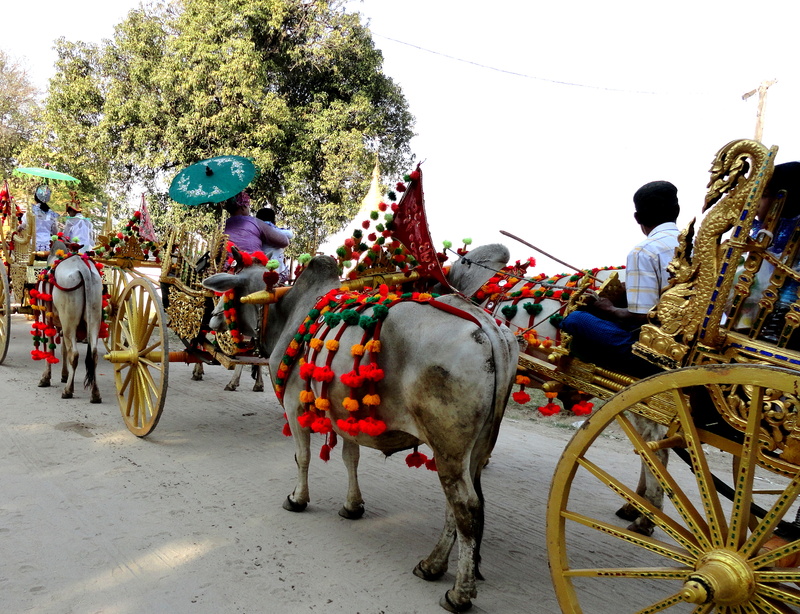 Most of the animals in this parade were obtained from the fields where they were working as they were somewhat dirty. 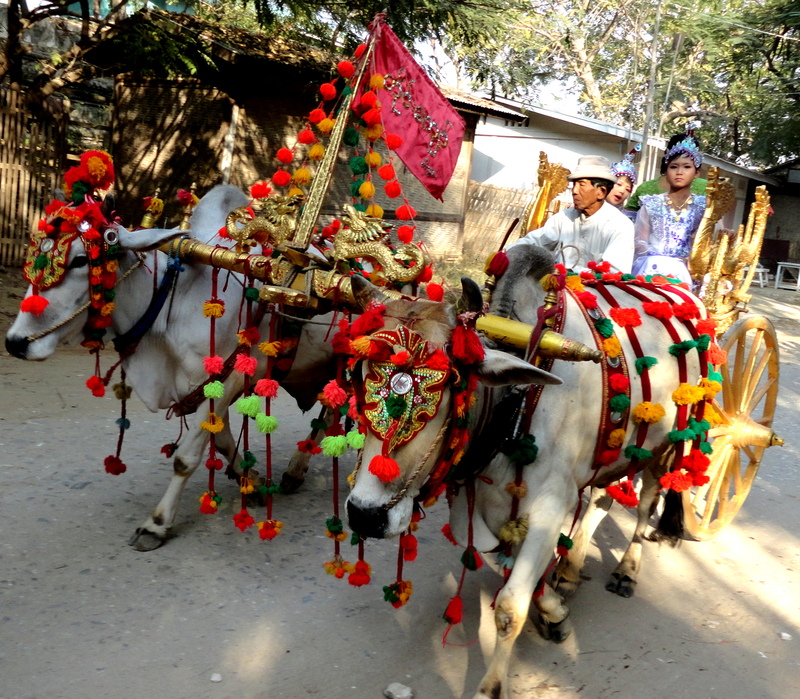 Formal invitations are set out to the entire village inviting them to participate in the ceremonies. The parade starts in the morning and goes into the early afternoon and that is when we saw it. 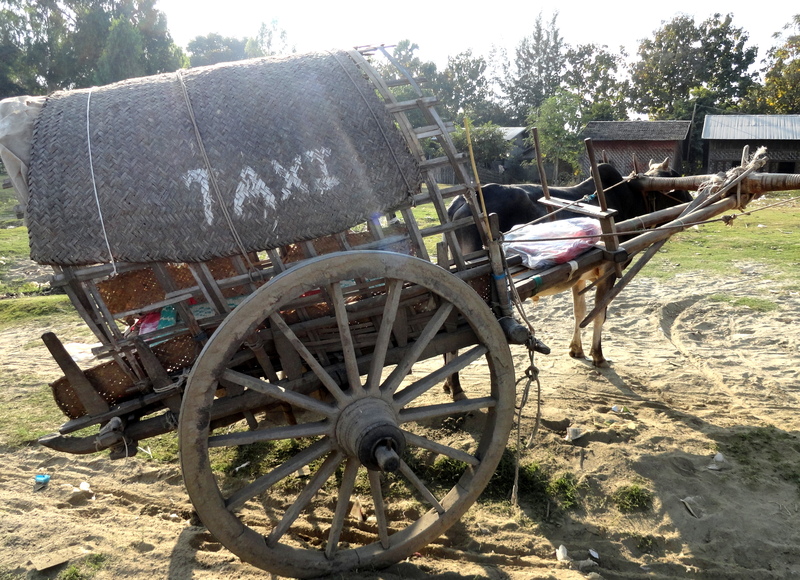 We had sailed down the (Ayeyarwady) Irrawaddy River from Mandalay to Mingun to ride a taxi cart pulled by a cow on the bank of the river through the village. Waiting for us was a little man who would help us into his cart. But the cart was at a 40 degree angle and we couldn’t get into the cart without sliding out. After 3 attempts, I gave up and let Joy try to get in and she kept sliding out also. As she was trying to get into the cart, I looked toward the village and saw an elephant walking about 2 blocks away. I told my Abercrombie and Kent guide who said we had just seen a rare event, called the Novice Initiation Parade. So we walked and ran as fast as we could and when we caught up with it, we saw the parade. Continuing to run and fast walk, we were able to see some of the fast moving parade. 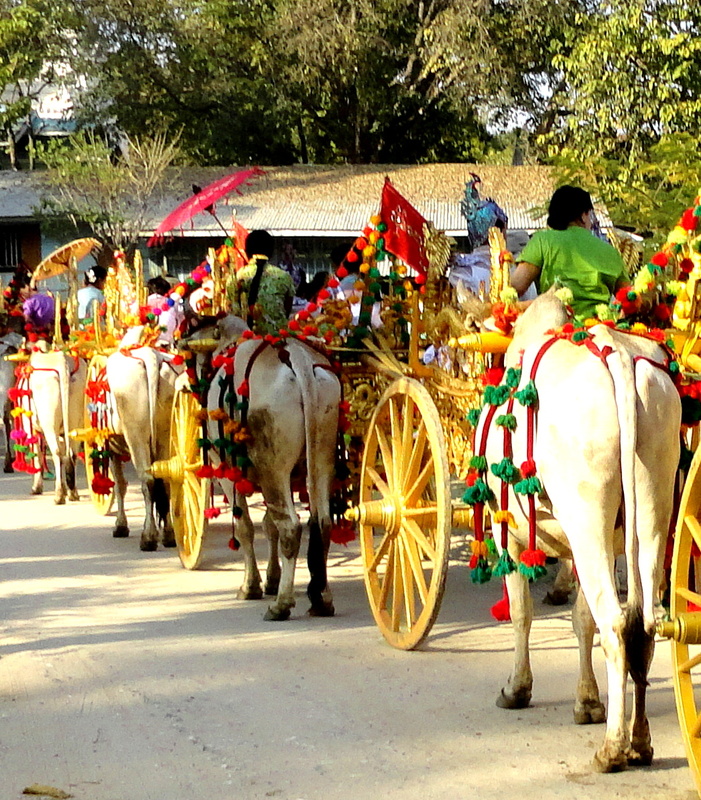 The parade proceeds around the village pagoda several times for hours. Finally, the parade stops at the temple so the people can pray and rest. Then the children go to the monastery-nunnery in the afternoon where their life as they know it changes for one week or a lifetime. A child may leave at any time after one week and can re-enter the monastery-nunnery several times but at age 20, each becomes a monk or nun. Our A&K guide had entered and left 4 times. The young novices in white in line to eat one of their 2 meals a day provided by volunteers wanting to earn merits for a good deed. Upon entering the monastery-nunnery, the child surrenders to having the head shaved. As the hair is being cut, the child and parents kneel and the child recites on body defilements to increase self detachment from the hair for it symbolizes impurity. The hair falls into a white cloth which then is presented to the parents. After head shaving, the child changes into a white robe, kneels and recites the 10 Precepts of Buddhism. The parents watch all proceedings and present their child with their alm bowl for food, their monastic robe, maroon for boys and pink for girls, and a palm leaf fan for hot days. Then, a child changes into the robe and receives smiles of joy and tears from the parents. 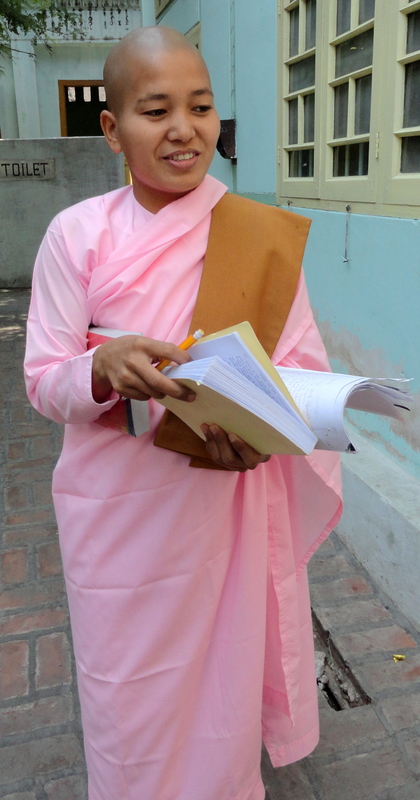 This novice nun in the nunnery we visited was going to a class. This nunnery we visited was beautiful, just fitting for a new novice nun. Next, the child changes to a new Dharma name in the Pali language that is based on the astrology-based naming system. And each must abide by the many rules and regulations of the monastery-nunnery including rising at 5 a.m. to meditate. Then they can go out into the village, barefooted and wearing only their robe, to collect donated food in their alm bowl. They must line up in single file and proceed by the line of people donating food in an assembly line process. Buddhism followers provide rice, spices, meat, fruits and vegetables for each alm bowl to receive merits for doing a good act. The last meal of the day is at 11:30 a.m. and is obtained the same way as earlier. Then the next meal will be at 5:30a.m. the next day. The parents return to Mingun village of 50,000 people and the last celebration occurs that night to honor success of the children entering the monastery or nunnery. The 2-day celebration began with the community sending well wishes to the child. The royal clothes, makeup, flowers and grand celebration now has ended and the child’s life has changed. 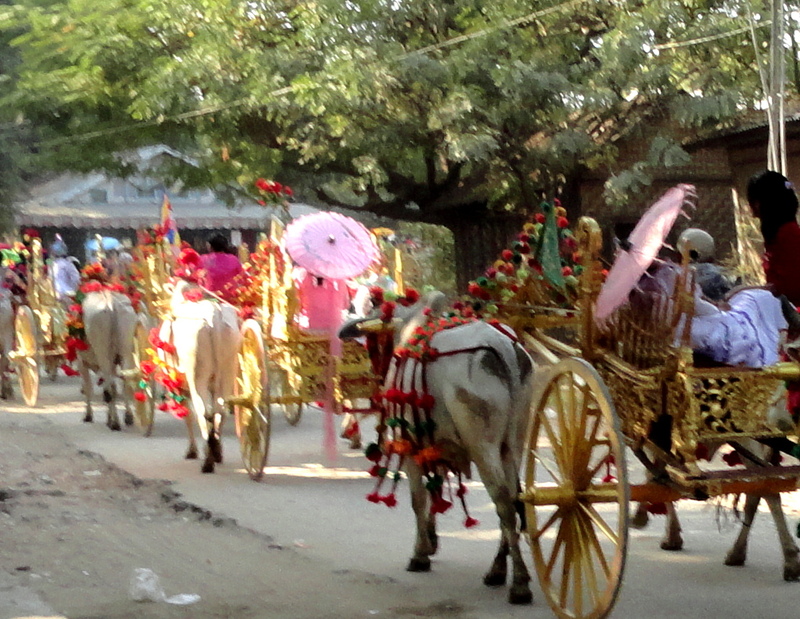 The horses, cows and elephant have gone back to their normal lives and so have the parents. And everyone is honored and proud to have participated in a glorious celebration of novitation.